KARIM Abdul, Louie Vigil, and Aljon Mariano saved University of Santo Tomas from another upset loss as the Tigers pulled away in the final quarter for a 73-57 win over University of the Philippines in Season 77 of the UAAP men’s basketball tournament at the Smart Araneta Coliseum Saturday. The trio of Abdul, Vigil, and Mariano combined for 14 of the Tigers’ fourth quarter points as they outscored the Maroons, 20-7, in the fourth period. The triumvirate also led an 11-0 UST run during that same stretch to seal the victory. The Tigers improved their record to 3-1 even after they were stretch to the limit by another winless team in Adamson a week ago before pull off a one-point victory. “We practice hard in our shooting. Nag-payoff naman nung fourth quarter,” said UST coach Bong Dela Cruz. Abdul finished with 18 points and eight rebounds, while Vigil added 17 including a 3-of-8 clip from behind-the-arc. Mariano chipped in 10 points. It was a sorry loss for UP, which led by as many as 11 points in the first half. 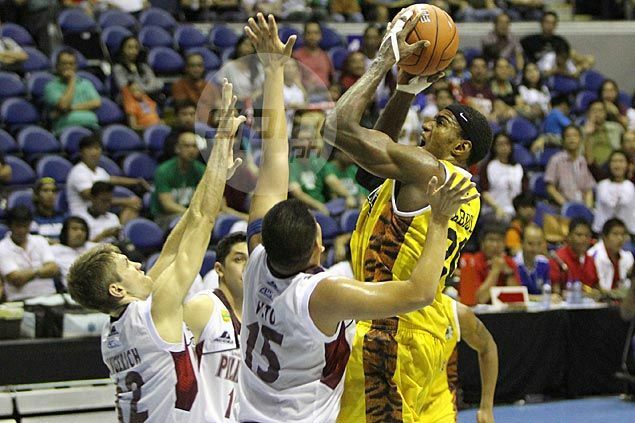 The Maroons last held the lead, 54-53, before that game-changing run by the Tigers. The Maroons led by as many as 35-24 in the second period, but the Tigers finished strong with Vigil converting a triple to make it a 39-36 deficit at the half. Dave Moralde had 15 points for the Maroons, who dropped their fourth straight game this season to extend their losing skid to 26. UST (73) -- Abdul 18, Vigil 17, Mariano 10, Ferrer 9, Daquioag 7, Subido 5, Sheriff 4, Lao 2, Gayosa 1, Pe 0, Lo 0, Basibas 0, Dela Cruz 0, Macasaet 0, Sablan 0. UP (57) -- Moralde 15, Gallarza 10, Asilum 10, Reyes 8, Lao 6, Amar 5, Dario 2, Vito 1, Juruena 0, Gingerich 0, Harris 0. Quarterscores: 14-19; 36-39; 53-50; 73-57.